Jacob Felder is a professional Dancer, Yoga Instructor and Choreographer. 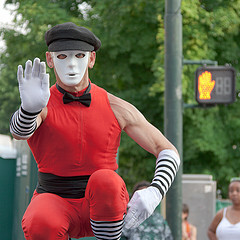 He has trained in a wide array of dance genres including Ballroom and Latin Rhythms as well as Acrobatic dance forms. In 2003 he began studying and training as a circus style acrobatic balancing partner. Since that time he has developed a spellbinding performance for such events as festivals, parties and conventions. He now works with fire-dancer, Kara Chambers, of Exuro Entertaiment. Together they display a captivating performance of strength, balance, and sensually rich choreography filled with graceful dexterity and precision. In addition, he is a fire dancer and fire breather. He also accompanies Kara with her fire-dancing using his ballroom style background to create a unique addition to the genre of fire-dancing. 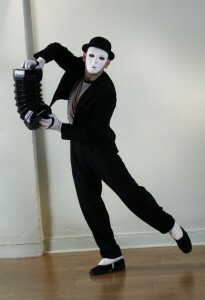 As a soloist he mesmerizes crowds with his whimsical and curious antics as a traditional mime and robotic mime. Jacob, it was great to see the spread of you and Kara in the goTriad. I’ve thought of you often and still practice the poses you taught me. It sounds like a fantastic act – balancing with fire!